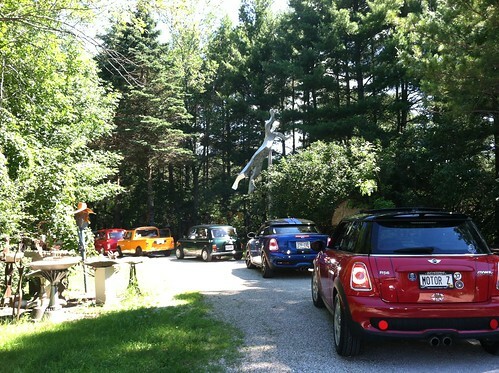 We are joining up with the Milwaukee MINIs for a fun drive and pizza stop..
WRAPUP: A chilly but nice day brought out about 35 or so MINIs from the Wisconsin and Chicago clubs, plus one MINI owner just driving past who saw the crowd of cars 😉 We took a fun drive thru some great roads. Trees are starting to turn so plenty of colors watch. The end destination was a pizza stop. Huge thanks to Milwaukee MINIs members Renee and Adam for all the planning and leading/following the group. High Mileage MINIs.. Checking if there is enough interest in a mileage grill badge. These are made of metal and are very sturdy. Looking to place an order (if enough interest) in about 4-6 weeks. Price will depend upon exceeding the minimum order number, but will be about $30. Comment if interested. There may be a discount if you buy 3 or 4.